Don't Turn the Page is a completely charming, cozy book-within-a-book by Rachelle Burk, perfectly paired with illustrations by Julie Downing. Don't Turn the Page is also a standout for being published by Creston Books, a brand (two seasons) new children's book publisher based in Northern California dedicated to resurrecting the "golden age of picture books, when fine books were edited and published despite not being blockbusters." Creston Books's books, which are printed IN THE USA, are beautifully packaged and standout on the shelves for what is on the outside as well as the inside. Best of all? Creston Books was founded by children's book author Marissa Moss! You can read my reviews of many of her books here. On the first page of Don't Turn the Page, we find Mama asking Sami if she is ready for a bedtime story. Sami is not - few kids ever are - but Sami's Mama is both patient and clever. She suggests that Sami pick out a book to read later, knowing that she won't be able to resist hearing it read out loud. But Sami is clever too, and, after Mama begins to read a story about a sleepy bear getting ready for bed, she tells Mama, "That's enough. Don't turn the page." Intrigued by Little Bear's bedtime rituals, Sami ask Mama to read another page and Sami decides that she wants to do what Little Bear is doing, always insisting, "Don't turn the page." 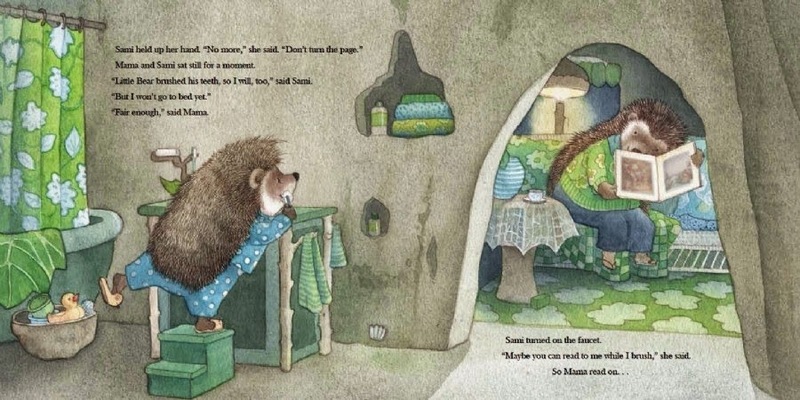 As Don't Turn the Page unfolds, Downing's illustrations allow the reader to peek over Sami's shoulder and see inside the book that Mama is reading her, sometimes in a full, two page spread, sometimes as a small corner of an illustration, as seen below. Best of all, Little Bear's Mama is reading Don't Turn the Page to him! 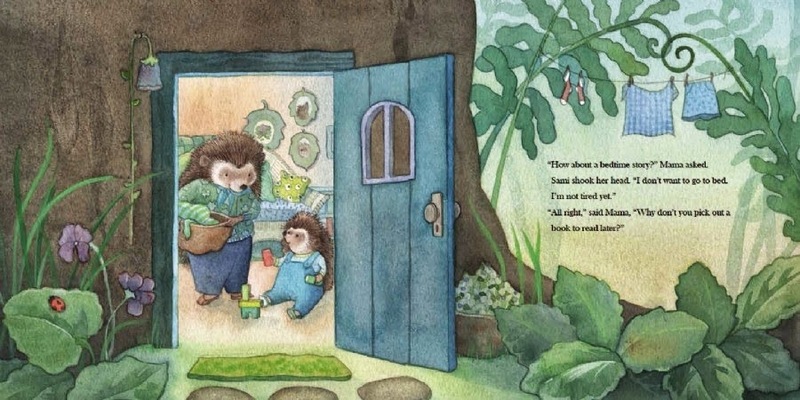 Readers get glimpses of the front cover of the book and some of the illustrations in this story-within-a-story while Sami's Mama shows off the back of Don't Turn the Page, which shows Mama and Little Bear, a hedgehog toy in his arms, reading Don't Turn the Page. Apologies for the kaleidoscopic, confusing description, but I guarantee you kids - who are always on the lookout for little details in picture books - will delight in spotting this! 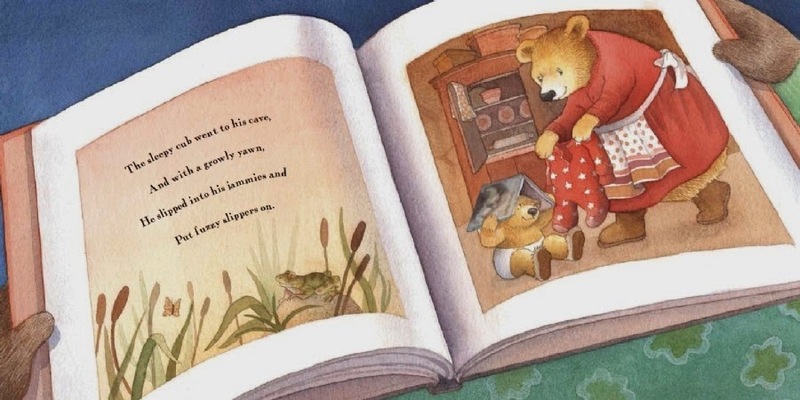 The inevitable end to Don't Turn the Page and Little Bear's story-within-a-story is sleep. As Little Bear and Sami are tucked in, Burk and Downing have one last surprise for readers. The final pages show Mama and Sami, as seen through the window of their hollow-tree-home right next door to Little Bear and his Mama, who is standing in her doorway, looking toward Sami's house!